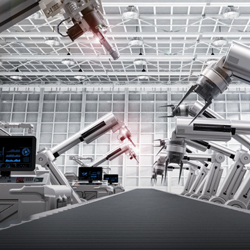 Creators of industrial equipment endeavouring to satisfy the size, power and performance requirements of Industry 4.0 applications are now offered an expanded family of digital input devices from Maxim Integrated Products. One of the new devices, MAX22192, is combined into the company’s Go-IO PLC reference design. As manufacturing becomes more automated, there is a greater need for real-time decision-making and feedback-loop mechanisms. These intelligent Industry 4.0 systems need digital input ICs inside the PLCs to receive on/off status signals. However, for ease of integration through manufacturing environments, the devices must be sturdy, high-performing and compact. The company’s expanded portfolio of IEC61131-2-compliant digital input devices offers what is claimed to be the industry’s smallest solution size (by as much as 50%), features the lowest power dissipation (by as much as 60%), is up to 6x faster and has the most robust performance (integrating 1kV of surge protection and integrated diagnostics). Also, the family also includes a parasitically powered digital input that reduces power dissipation by up to 60% and does not require a discrete isolated power supply.